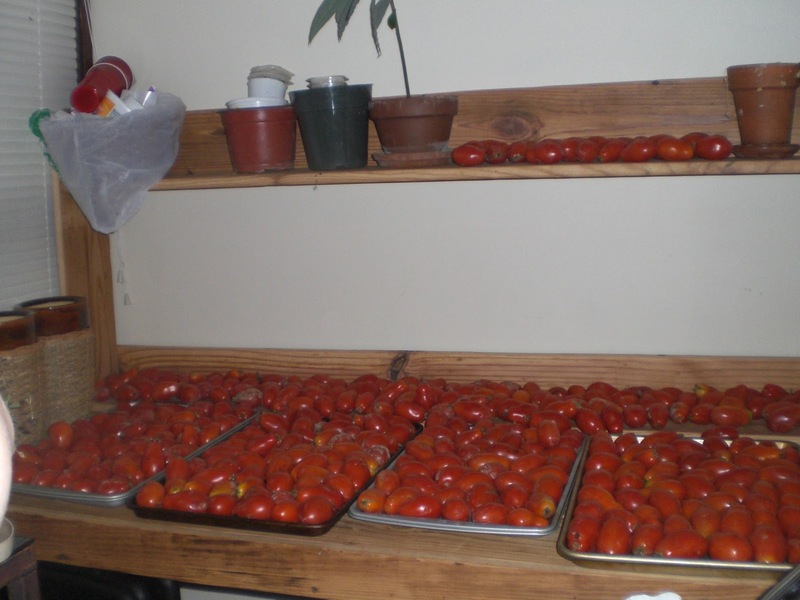 gardening in the boroughs of nyc: What do you do with a bushel of tomatoes? 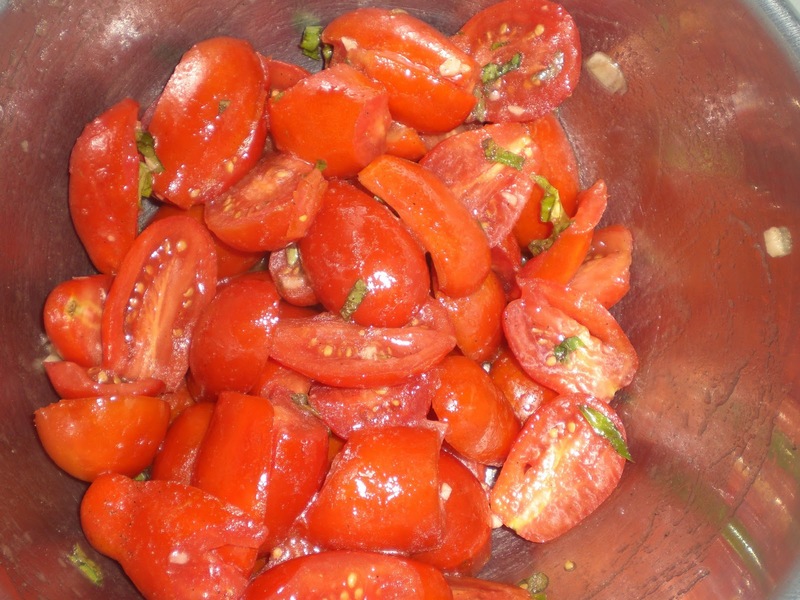 What do you do with a bushel of tomatoes? A lot of the produce that is grown on my in-laws farm is sold at two local farmers markets in their area. Upon speaking with his dad, the hubs said to me that we could go out to the fields and harvest some Roma tomatoes because they were too ripe to sell at the market. 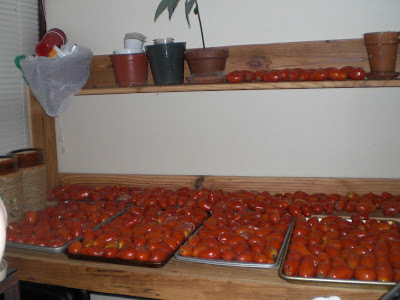 Since there were more tomatoes than the family could use, he said we could take as much as we wanted because it was going to turn into compost. Nice! Out to the fields we went and picked a bushel of tomatoes. What does one do with a bushel of really ripe tomatoes? Sauce here we come! 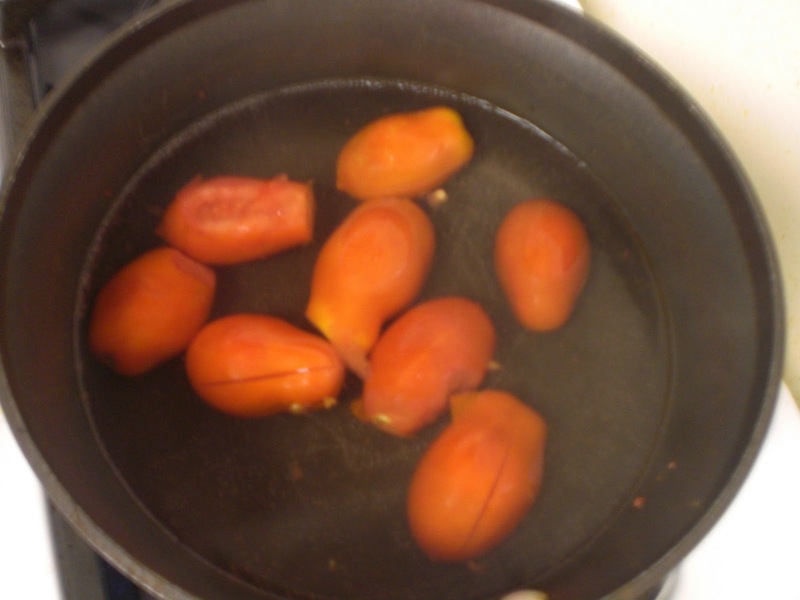 I took half of the tomatoes, washed and removed all the skin by putting them in scalding water. This took a very long time to remove the skin. I do like my sauce without skin, but this was a long process. I think it took me 2 hours to wash the tomatoes and remove the skin off of half a bushel. I have to re-think whether or not I want to do that in the future. Maybe I can learn to like tomato peel in my sauce. Half of a bushel filled two large stockpots, along with oregano, basil herbs grown from our garden. I simmered the sauce for about 3 hours. 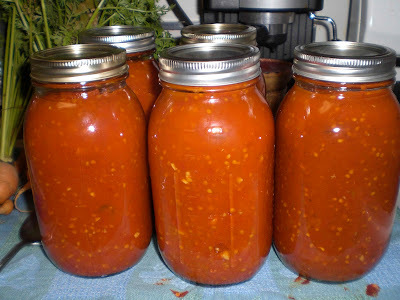 This was my first time ever canning sauce so I was dreaming of lots and lots of cans that this would produce, however I forgot how reduced sauce gets when you cook it down. In the end, all that work made only 5 quarts of sauce. I laughed out loud, but it was a "All that work, and I can't believe I made only 5 quarts" laugh. Haha. My husband laughed and said, "It's so much easier to buy a jar from the supermarket". He's right, but I think my sauce tastes better. And it's 100% organic! 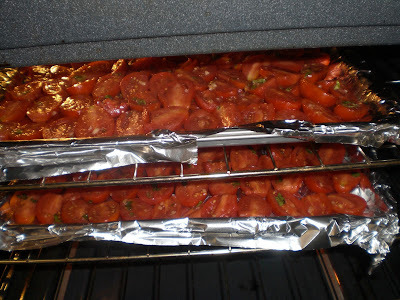 The following day, I took the other half a bushel and decided to make oven roasted tomatoes. 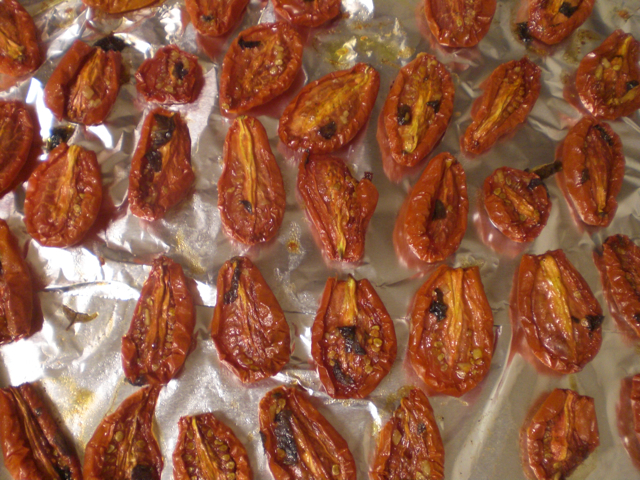 I've read on many blogs about how incredibly tasty oven roasted tomatoes were. I followed the recipe on Smitten Kitchen. Wash all the tomatoes and slice in half in a large mixing bowl, mix with olive oil, salt, pepper, garlic and fresh herbs. This smelled amazing, I could eat it just like this!! I lined the tomatoes on baking cookie trays lined with aluminum foil. Foil makes cleaning so much faster! To maximize on oven space, I put a filled tray on each oven rack. Roast baby roast. 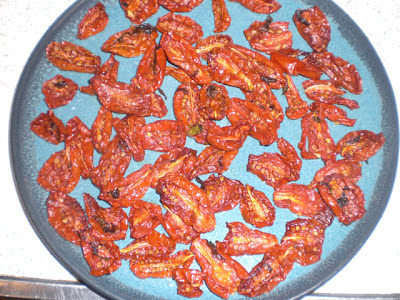 I guess my tomatoes were too large because it didn't take 3 hours for this babies to roast like it says in the recipe. It took mine 7 hours! LOL. I really don't think it's a good use of the energy it takes to run the oven. I need to invest in a dehydrator! Look how much the tomato shrunk? I packed those tomatoes in, where they practically touched each other. I love how much it shrunk. I transferred the tomatoes onto plates to let them cool down to room temperature. I popped one in my mouth, and yes, the flavor is like an intense tomato. It is amazing how much the sauce condenses down!!!! I made a big pot of sauce yesterday... and also got 7 quarts! It may be easier to buy it at the market, but when you make it yourself it's always better!!! And you know where the tomatoes came from... and how they were grown... and that... is becoming priceless! Enjoy your sauce and dehydrated tomatoes. I've got to harvest a bunch of cherry tomatoes this week. I'm going to dehydrate them! The roasted tomatoes look good. 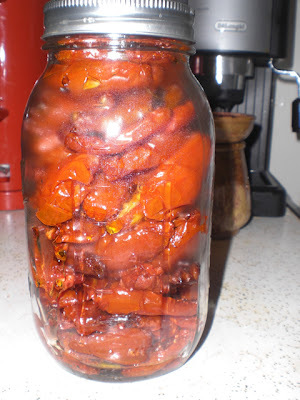 I've never canned tomatoes could you also freeze the roasted tomatoes? You are right alot of work but the rewards when no one else has fresh is the plus here!!!! I use to help my Mom can Tomatoes and well it's just too much work to think about. But lucky you have a supplier :) I guess I would do it if my Mom was still here to push the issue. Look at all those roma tomatoes, wow. We never mess with the skins on any of our tomatoes and find that if they are cooked hot enough the skins pretty much dissipate and become unnoticeable anyway. Last year some neighbors of mine made a Tomato- basil Jam and gave us some for Christmas. The recipe came from Molly Katzen. My god, it was like summer in a jar! I think it will need to become a Christmas tradition. 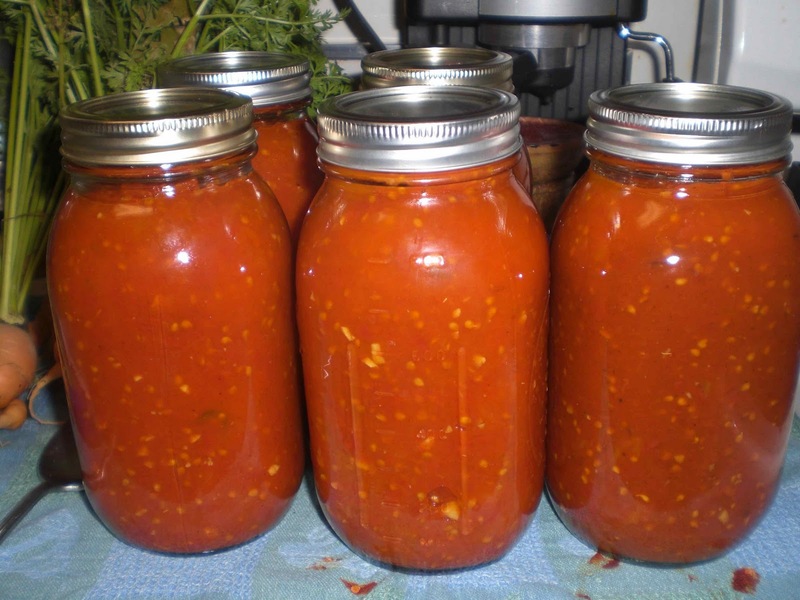 You will enjoy the sauce and roasted tomatoes this winter. What a treat! I haven't had that many tomatoes at a time. Since I'm still on a soft food diet, I've been throwing a cup or two of chopped or whole grape tomatoes into my VitaMix with whatever leftover vegetables I have, and making a creamy soup. I also add milk, and sometimes cream cheese or other cheese when I eat them. I am freezing some without dairy in individual servings, so I can thaw them and add the dairy when I'm ready to eat them. I forgot to say I've also put some tomatoes in the VitaMix, blended them, and froze them in freezer bags. I can cook them when I thaw them. I've canned a handful of times now and it gets easier each time. I'm sure there's an easier way to do the skins - I hate them too. I also don't like when the roll off and turn into little sticks. I wonder if a food mill would help? Maybe you should look into some sort of gadget? I'm obsessed with gadgets right now. Those jars do look awesome - and the dried tomatoes will be enjoyed for a long time! 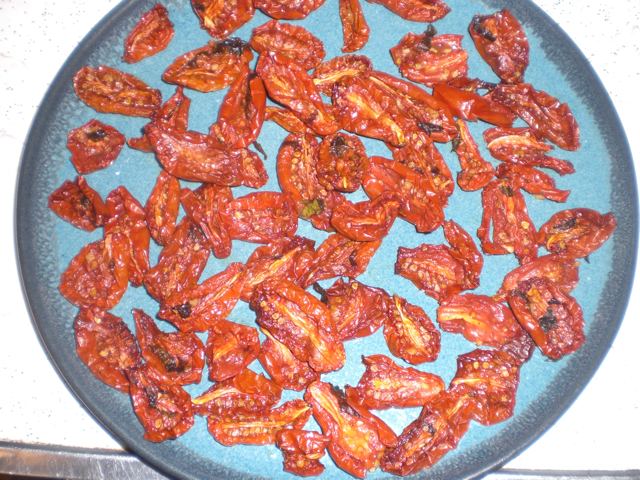 To add to the work, some tomato sauce wonk will tell you that you need to strain the seeds out before making sauce! 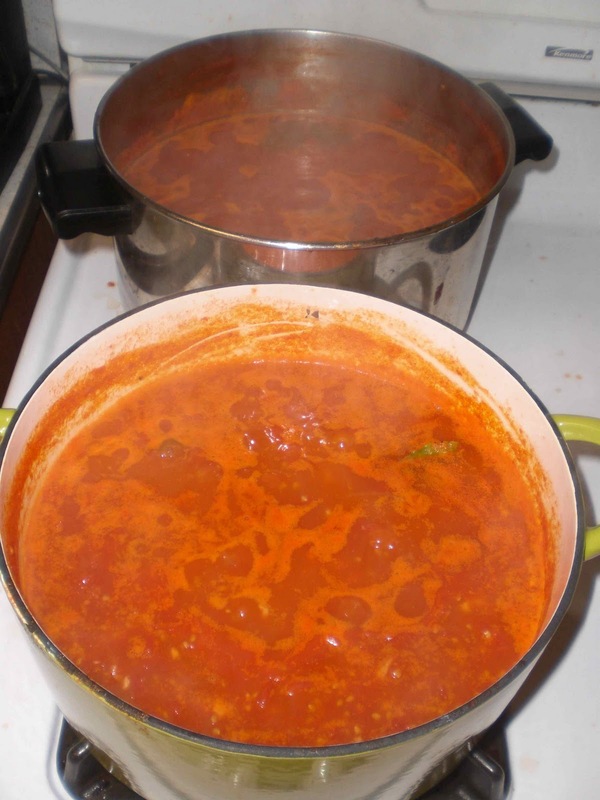 Hi meems - I don't have the Tomato-Basil Jam recipe on line (just xeroxed), but would be happy to mail it to you if you send me your address at nyackbackyard@gmail.com. It calls for tomatoes, honey, both balsamic and cider vinegar and fresh basil! That's a nice haul of tomatoes! We have an Excalibur dehydrator and love it. 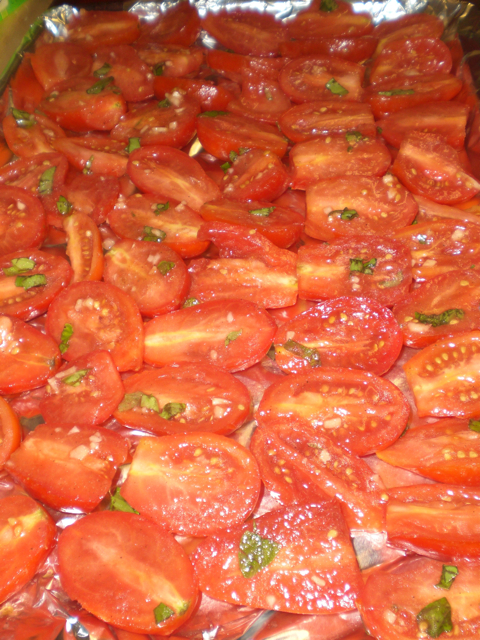 But we still oven roast tomatoes too, even if it does sometimes take longer than the 3 hours. It would take a lot longer to use the dehydrator. I don't think there's any comparison between homemade and store bought sauce. The homemade is so much better, even if it is a lot of work! I've frozen the tomatoes whole. Soak them in hot water for a few seconds and the skin slides off. I tried to skip a step last year and left the skins on all of the smaller tomatoes. Result: a bitter taste to the sauce. Yep, it's a lot of work (I do also strain out the seeds), but I feel so smug as the pantry fills up. All the work now saves time later, when it's just heat and eat for a gourmet experience. Feeding the plants while on vacation! The best thing about farmer's markets!! Soaking up the Last Weeks of This! End of Season Sales Rock! I'll never go back to store bought! Fall is well in the Air!